The Sounds have announced their new LP Something To Die For (out March 22, but available for pre-order), and along with it the first song “Better Off Dead” (with a contest for its b-side) which is available now. Listen to it below. The Swedes will help promote that release by visiting Texas, NYC, Mexico & California in March. 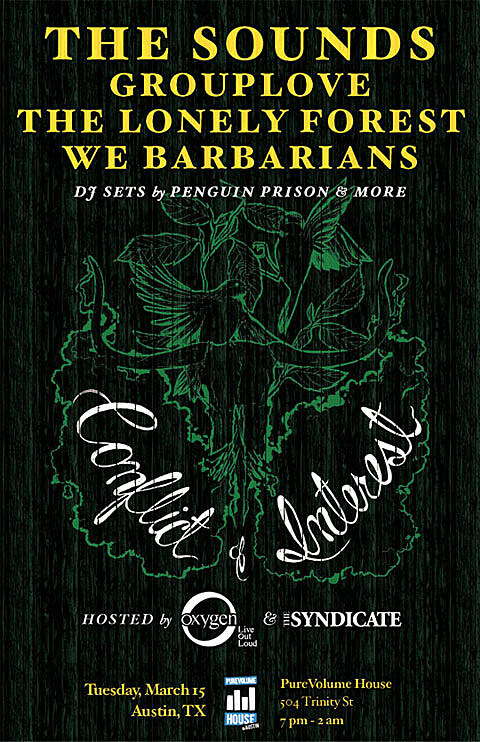 You can catch them on March 15th, one night before SXSW Music starts, at the Syndicate’s first-annual pre-SXSW ‘Conflict of Interest’ party (the same party that’s been happening on CMJ-eve for years). All details and the full lineup for that free show are below. After Austin the band hits Brooklyn for a show at Music Hall of Williamsburg on 3/21 (less than a month away and one day before the album comes out). Tickets go on AmEx presale Wednesday at noon (3/2), and regular sale on Friday. After NY they head to Mexico and then LA and then San Francisco. After twelve years of successfully kicking off the CMJ Music & Film Marathon in NYC, CONFLICT OF INTEREST makes its premiere appearance in Austin on Tuesday, March 15th. The event takes place at the PureVolume House* (504 Trinity St) from 7pm – 2am and features performances from The Sounds, Grouplove, The Lonely Forest, We Barbarians, a DJ set by Penguin Prison, and more. Complimentary drinks will be provided all night, as well as complimentary books courtesy of Simon & Schuster. Come early, stay late.